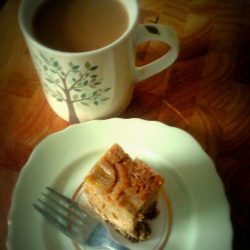 Here is my recipe and its Potential Pitfalls. 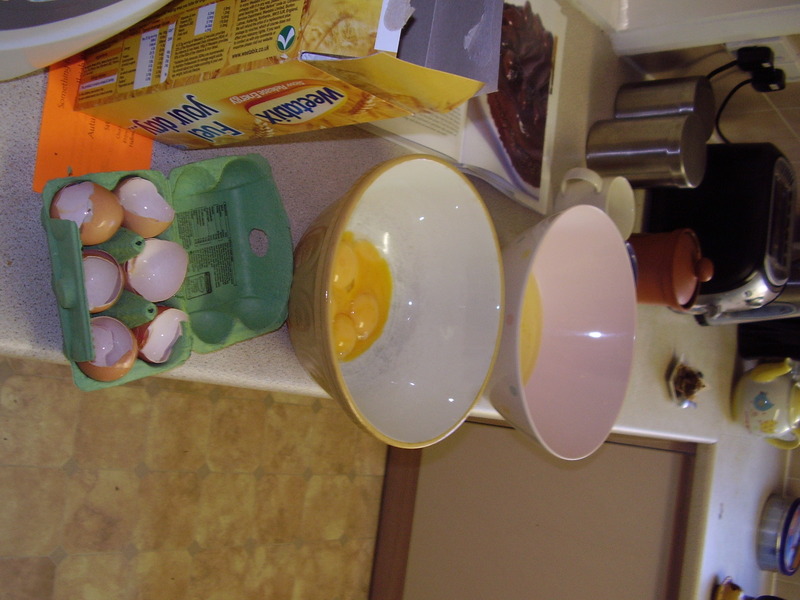 Separate 6 eggs. 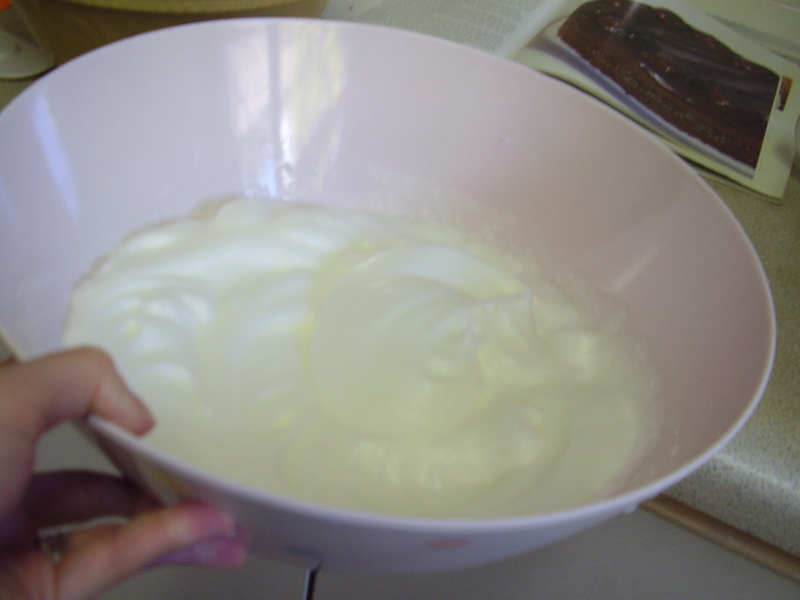 The egg whites need to be in a very clean grease-free bowl. You must not, on any account, get anything in the egg whites. Absolutely no yolk, no shell, no cocoa powder, no fluff etc. This is pitfall number 1. I have seen people separate eggs through their fingers, you can buy special tools for it (note this is not part of my Essential Kit), but I use the egg shell to do it. 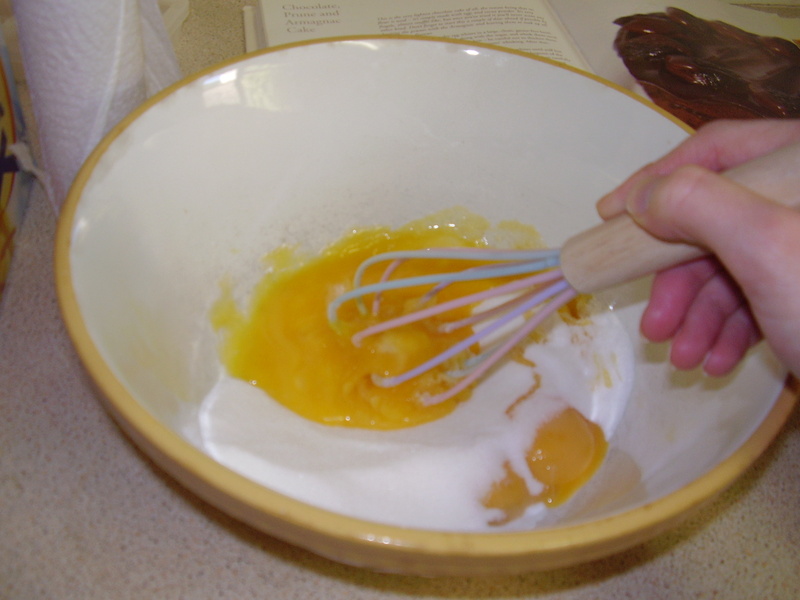 Next whisk 5oz caster sugar with the yolks until they just begin to turn pale and thicken. 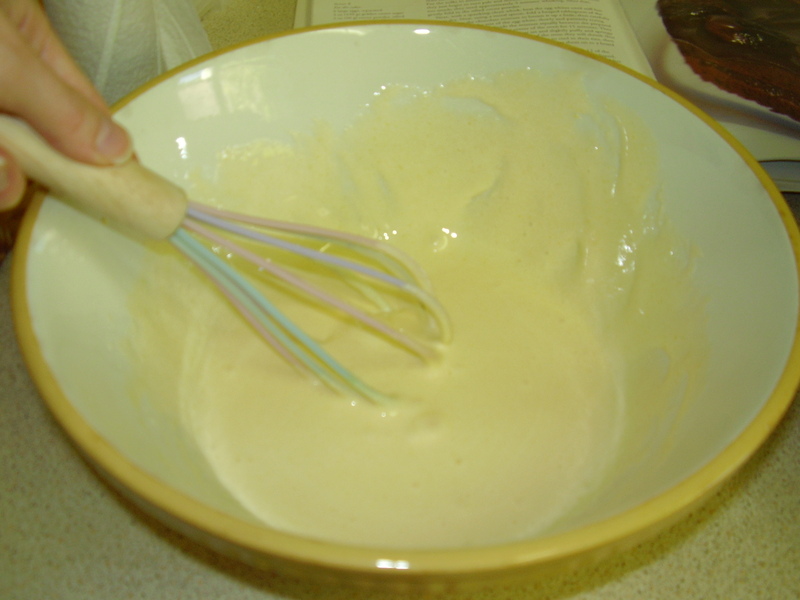 Do not whisk them too much – only for about 3 minutes. Overwhisking here is pitfall number 2. I have no idea what happens if you overwhisk, but it could be painful. Next sift in 2oz cocoa powder and fold in. 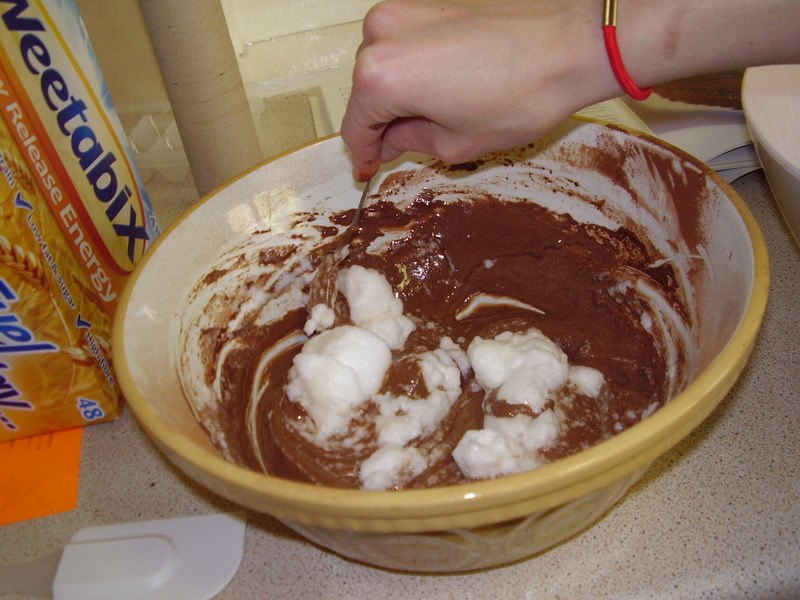 Don’t let any cocoa powder drift into your bowl of egg whites. This is only a potential pitfall if you’re silly enough to put the bowl of egg whites next to the yolks one, so I’ll call it pitfall 2a. 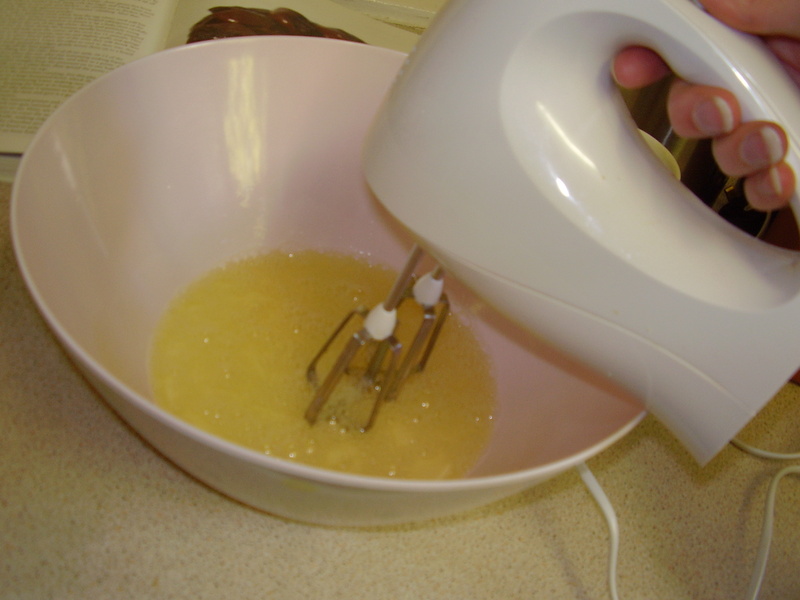 For the next step you need a “spanking-clean” whisk, to quote Delia, so I used my electric handwhisk. Beat the egg whites until stiff but not too dry (potential pitfall number 3). Too dry? 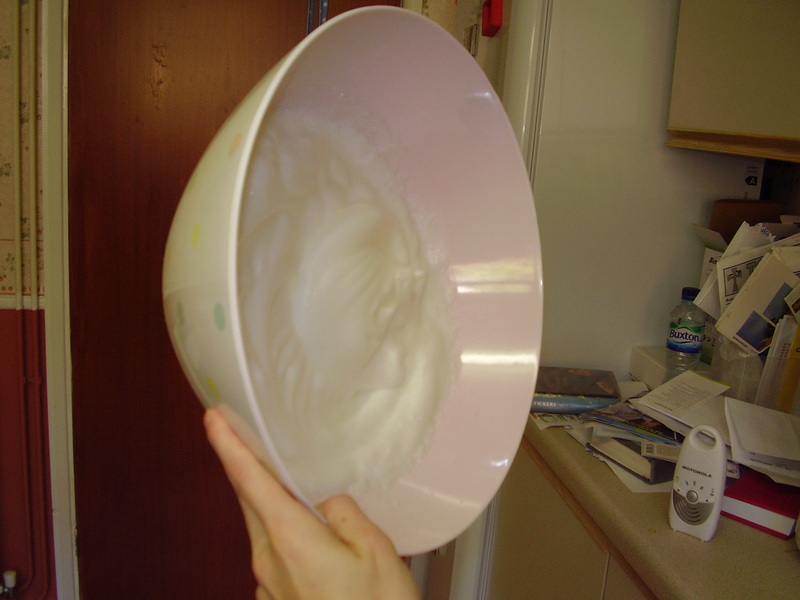 They’re egg whites – how do they get dry? Beats me. Anyway, I beat them until they stay in the bowl when turned upside down. Except I’m not brave enough to turn the bowl the whole way upside down. Six egg whites on the floor would definitely be pitfall number 4. 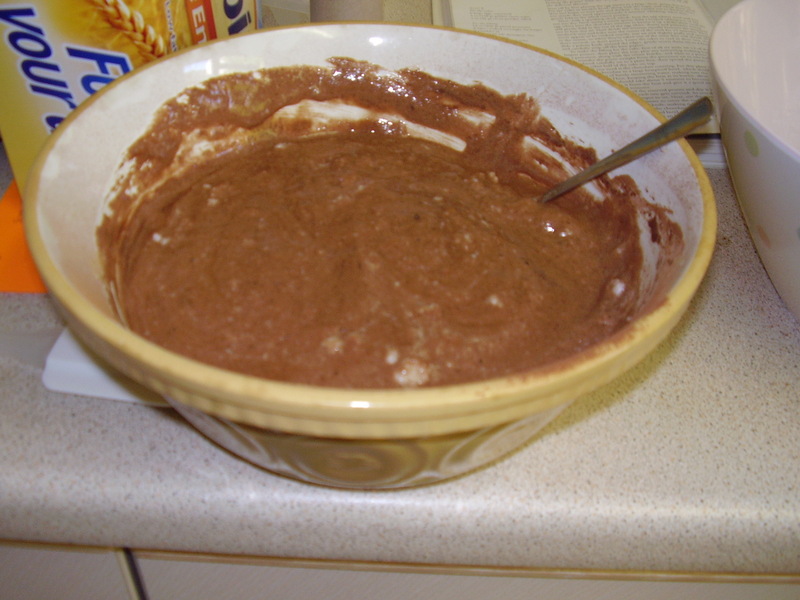 Finally fold the egg white into the chocolate mixture little by little. Do not lose any air, or you will undo all your hard work. So don’t use a wooden spoon (pitfall 5), only metal or smooth plastic. Don’t beat the whites in (6), fold gently using a figure of 8 movement. Don’t tap your spoon on the bowl as this pops bubbles (7). 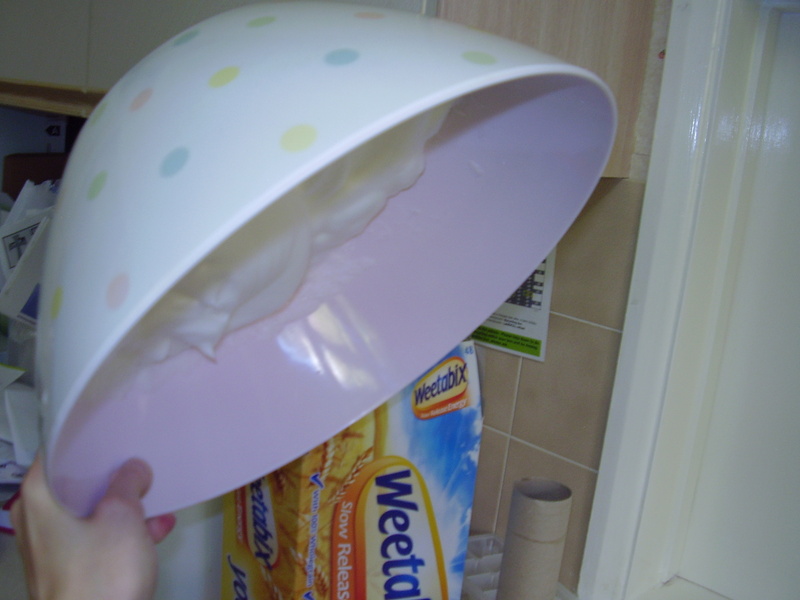 Don’t knock the bowl against the worktop (9). Don’t laugh too loudly (10) or play music of a high frequency (11). Be careful ok?! 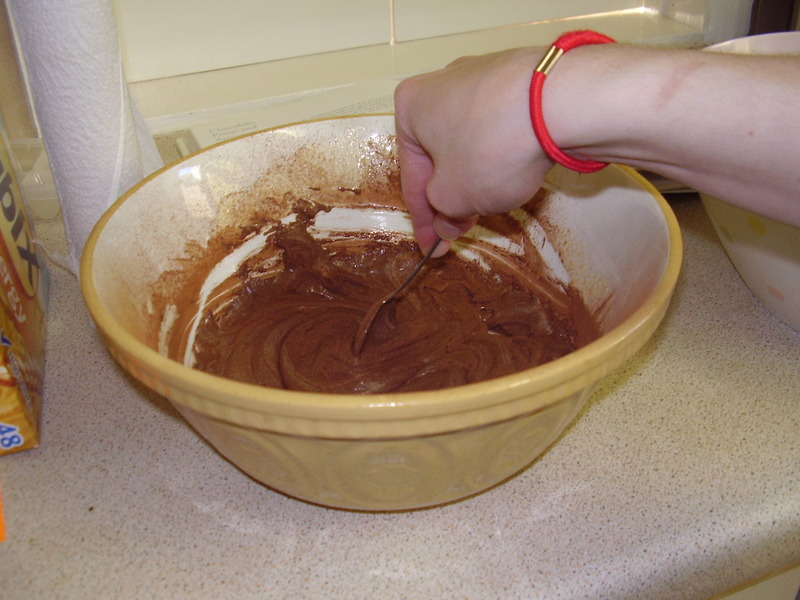 Pour the mixture into two lined 8 inch cake tins. 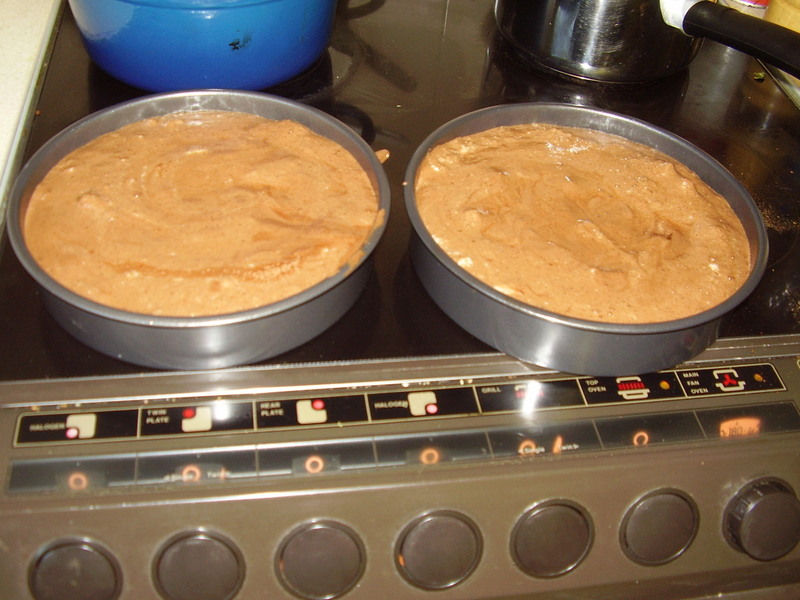 And bake in the oven at 180 degrees for 15 minutes until set (they’re more like souffle than Victoria Sponge). I read somewhere, when you are cutting out circles to line your cake tins, cut out extra circles too and store for when you are baking in a hurry. The idea appeals, but I’m always baking in a hurry so I wouldn’t have time for that! 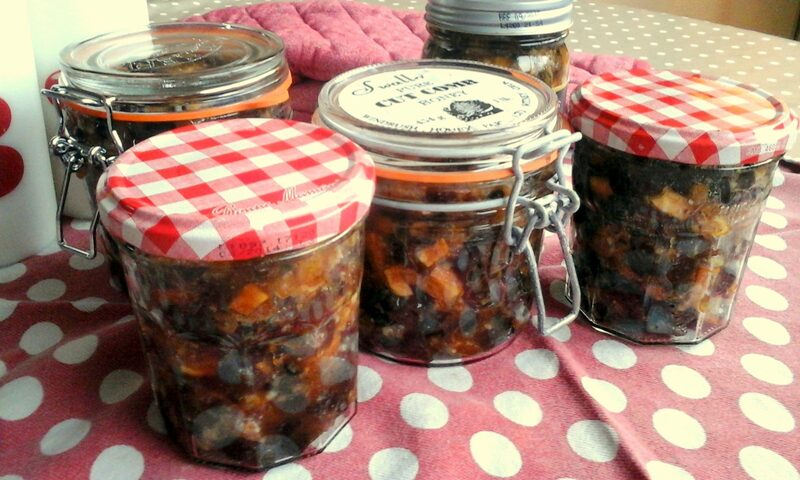 Let the cakes cool in the tin. They will sink slightly but don’t worry, they’ll still taste great. 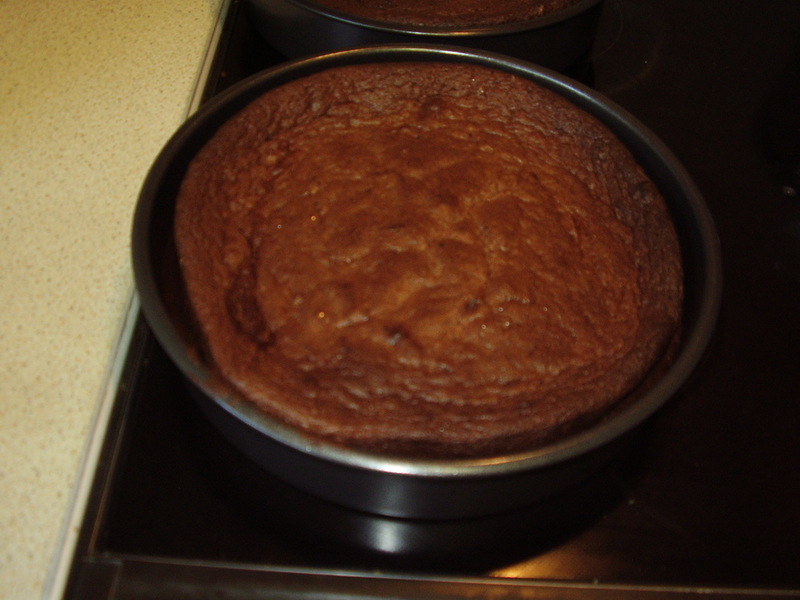 When cool, peel off the backing papers and fill and ice your cake. 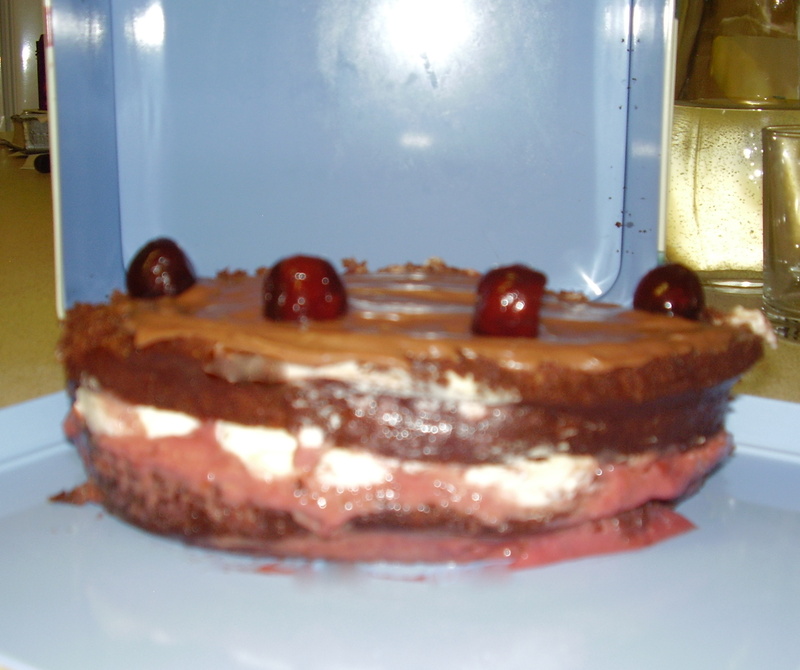 I filled the cake with cherries and cream. I made a topping from one block of melted chocolate mixed with a bit of creme fraiche. The cake was so delicious that most of it disappeared before I could take a picture. But here are the remains. And remember, baking is not always fast, but it is always easy.